The Sea of Hands is one of ANTaR’s major reconciliation community campaigns. 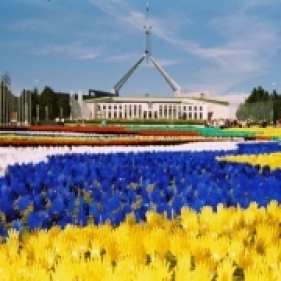 The first Sea of Hands was held on the 12 October 1997, in front of Parliament House, Canberra. It was created as a powerful, physical representation of the Citizen’s Statement on Native Title - a petition circulated by ANTaR to mobilise non-Indigenous support for native title and reconciliation. 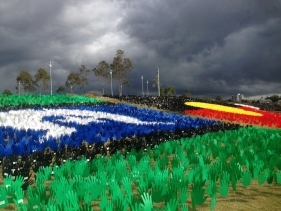 Hands in the colours of the Aboriginal and Torres Strait Islander flags, each one carrying a signature from the Citizen’s Statement, were installed in front of Parliament House in what was then the largest public art installation in Australia. The Sea of Hands has since become a symbol of the People’s Movement for Reconciliation. Over 300,000 Australians have signed their names on one of 120,000 plastic hands that make up the Sea of Hands, which has been installed in every major city and many regional centres, and continues to gather signatures everywhere it appears. Today, the hands symbolise community support for RECONCILIATION, RIGHTS and RESPECT. Planting a sea of hands is an act of recognition – of identities, cultures and history. Want to book the Sea of Hands? Click here for information. There are a number of ways you can support the Sea of Hands campaign for reconciliation. Buy a Sea of Hands pin. You can buy pins for yourself or buy in bulk to sell as a fundraiser at your school, university, workplace or community event. Buy online at the ANTaR online shop. Hold a Sea of Hands event. You can book the Sea of Hands to visit your school or community. Book online here.